I’ve posted previously on Peter Sloep’s work on learning networks. I found this chapter to be a useful analysis of the concept of networked learning in relation to professional learning specifically (and that’s an important distinction). What the diagram attempts to summarise is that professional and knowledge-based integrated work and learning tends to take place where learning is predominately informal (as needed and highly situated) as professionals are addressing ill-defined and complex work problems. Such problems require (interdisciplinary) professional knowledge creatively applied. Valuable professional knowledge work and valuable professional learning takes place through tackling ‘wicked’ problems. So how might learning and development functions and professionals best support and enable learning in these wicked problems? 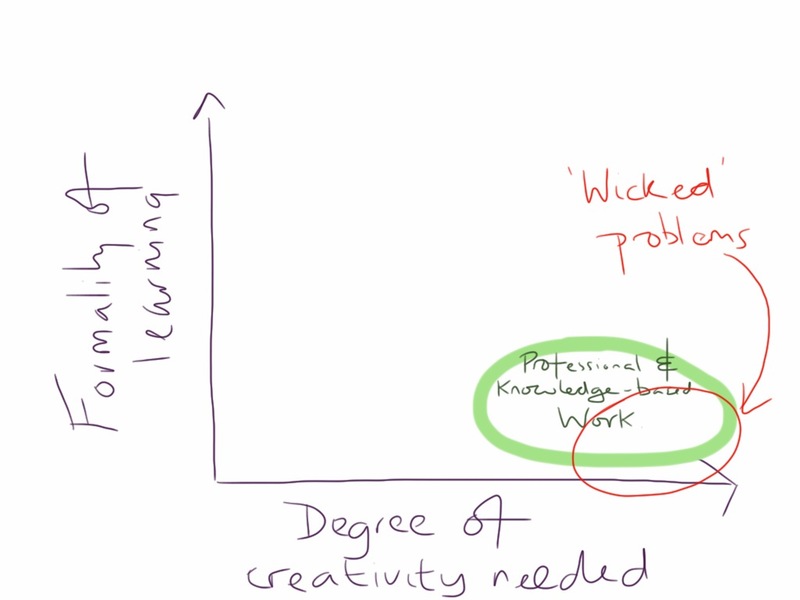 Does professional education currently develop the creative and meta-learning capabilities required for working in and on wicked problems?